Jump on these summer deals at SeaWorld! and, especially appropriate as we head into the Independence weekend, the Here’s to the Heroesprogram provides free single-day admission to SeaWorld service members and as many as three direct dependents. When you visit this summer through Aug. 30, keep your fingers crossed as you enter the gates. One lucky group is chosen each day to be the SeaWorld VIP Guests of the Day and win free tickets to the Dolphin Encounter, Quick Queue passes for all the rides, reserved seats at all stadium shows and an extra special shout out during Shamu’s show. 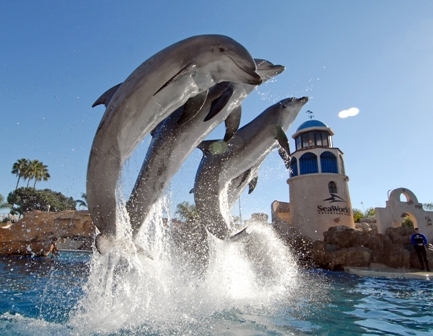 This entry was posted in Attractions, Family Vacations, Insider Tips and tagged deals, seaworld, summer by Kate. Bookmark the permalink. I just went to SeaWorld yesterday and the Dolphin show is closed until next spring. 🙁 Everything was super fun though. SeaWorld is a fabulous park. My kids absolutely love it even though we have been multiple times as a family. FloridaTravel, Do you visit in San Diego or out there in Orlando? I actually grew up with Shamu at the San Antonio park – we had season tickets. I’ve never been to the Florida park though!